Before the touchdown play, MSU hurried to the line of scrimmage and three WSU defensive backs were still getting in position when the ball was snapped. Murray and McCutcheon took advantage. Weber State has had the ball for 24:12. That's a long time. Could potentially take a toll on MSU's defense as game progresses. Weber State takes over with a chance to further its lead. 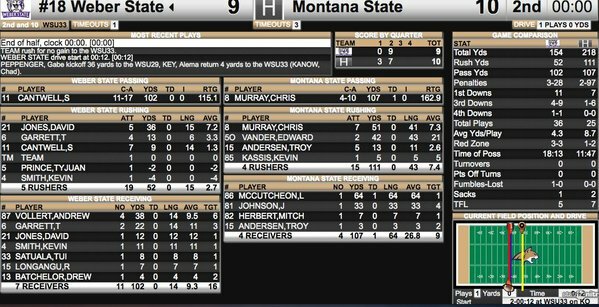 Montana State has hung close so far, but the Wildcats pounded the ball effectively on the ground on their last drive. Throughout the week, MSU head coach Jeff Choate said Weber State is the best team in the Big Sky. To live up to that billing, this would be a good time for the Wildcats to start expanding their lead. A false start on WSU bumps the Wildcats back to their own 26. Weber State is moving the ball, again, and is inside Montana State's red zone. WSU has pushed often but has been limited to field goals. If the Wildcats start putting up touchdowns, that could break the game open.